Raising Rama is a blog that chronicles the daily life of a Cane Corso named Rama as she learns, grows and blossoms into adulthood. 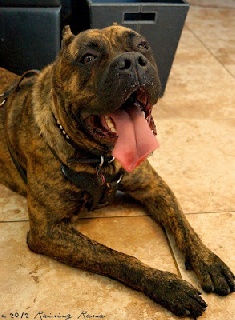 According to the Raising Rama blog, the Cane Corso (also known as Cane Corso Italiano and Italian Mastiff) is a molosser. They are descended from the canis pugnax, or Roman war dog. They were very common in Italy in the distant past, used as personal bodyguards, carters, drovers and catch dogs. A Corso In The Kitchen is the name of a book project Rama’s Mom is working on. She says she may begin a food-related post with this title. It may or may not be contained in the book. The project will not be limited to this one subject. Any developments will be posted on the blog, so fans are encouraged to check back back periodically for details on how to see your favorite Corso on a bookshelf near you!